The end of the summer is almost upon us and that back-to-school feeling is in the air, much to the chagrin of students (and teachers?) everywhere. Thus, in honor of heading back to school, this week’s roundup gathers together some of the recent studies on children and education. Starting from the top down, Carnegie Mellon University’s College of Humanities and Social Sciences has done a study, which they discuss on their YouTube channel, detailing how younger children (ages 5 to 7) learn better in sparser classrooms than in heavily decorated classrooms. 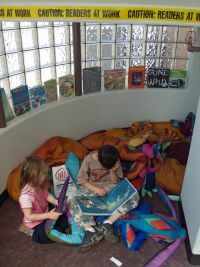 The researchers found that although children could learn in both kinds of environments, they did learn more and could focus better in the sparser environment, even if the highly decorated environment included solely educationally relevant and important material. Because this is part of the educational environment teachers can control, the researchers argue, paying attention to level of visual stimulation in the room should be considered an important factor and not just décor. Among the big buzzwords in American education these days is universal Pre-K. But what constitutes the universal Pre-K curriculum? That’s what the APA Monitor set out to investigate. In an article entitled “The Preschool Puzzle,” Kirsten Weir looked at two of the studies—the Abecedarian Project and the Perry Preschool Project—used as the basis for arguments pointing to the benefits of early education. The former study, conducted in the 1970s, followed African-American children in North Carolina, while the latter began in the early 1960s in Michigan, also with African-American children. Both studies followed the children into adulthood, and found that the early education led to higher scores on cognitive skills tests as well as more children attending college. However, there are concerns that with the bigger classes that universal Pre-K might create, teachers would not be able to give children the individual attention they need at that age, and if they do not get individual attention, would there really be a benefit to this early education? That is what psychologists and educators are now trying to sort out with these programs—how to create quality experiences for children that would lead to the kinds of benefits shown in those classic studies. Early research shows promise for Latino children attending Montessori-type Pre-K programs, according to an APA report, although this research is not long term. So, if a child does not have access to a Montessori school, what other kinds of things are good for kids these days, at least according to the recent studies? Well, for one, superheroes. CNN reports about that says that fascination with superheroes can improve kids’ self-confidence and feelings of power. According to the article, this helps children deal with their own vulnerability, as well as align with powers for good in the world. And George Washington appears to be more powerful than Pinocchio, at least in terms of role models for children and truth-telling, according to the Pacific Standard. Reporting about research on which classic children’s tales helped to get kids who fibbed to confessed, the article said that the story about George Washington chopping down the cherry tree convinced children to confess, whereas stories about Pinocchio and The Boy Who Cried Wolf did nothing to help children understand the consequences of lying. The difference, according to researchers, was that in the George Washington story, George’s father expresses his disappointment in his young son, and that seemed to be more threatening to children than the punishments. The bottom line with children and education, though, is often simply getting them to read. Two recent studies examining the brain during reading has provided insight into helping children with reading difficulties. The New York Times reported that reading experiences may actually help to change neural connections in the brains of children dealing with dyslexia. According to the article, new research indicates that those with dyslexia form accurate neural representations of the sounds but not of the written letters because the spoken language is used more often. When dyslexics try to put these two together it creates what the researchers call “disconnection syndrome.” Thus begins the vicious cycle of reading being harder so children read less and therefore the connections get even weaker and reading gets even harder. The research here indicates that with more reading, these neural connections in the brain can actually be improved—i.e., dyslexia is not hardwired—and reading can get easier with more experience. The APA has also reported on research that found that studies involving magnetic source imaging in the brain is helping children with various reading issues, mostly stemming from problems of decoding, figuring out the different sounds associated with different letters. Because this imaging can show researchers what is happening in the brain when good readers readers, it can help them develop techniques for children with these issues in decoding, such as dyslexia. Thus, it can help change the way children with reading difficulties are taught. While this text might be coming to an end, there are many other things out there to read. And while existential psychologists are often loathe to be directive, the directive to read, read, read, especially for children, but even for adults, always seems to me a good one.